I was led to Swedish baker Jan Hedh's book Artisan Bread by Dan Lepard's recommendation on TFL. I owe him thanks for that as it full of great formulae and beautifully photographed by Klas Andersson. There is lots in it to inspire. One of my favourite Hedh breads is a lemon bread flavoured with lemon zest and green olive oil (pp.126-7). Created by Hedh when lead baker on a Swedish cruise ship, this aromatic bread was designed to work well with fish dishes. It can be made in the shape of a lemon-shaped, small dinner bread or a more traditional round roll. 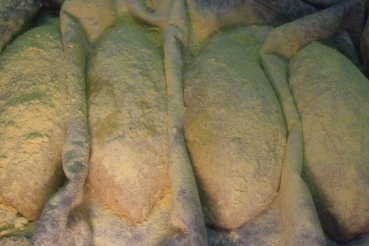 The breads are dusted in yellow semolina flour during the second proof, to make them even more lemon-like. Hedh's recipe gives enough for a small batch, In fact this is one of the few breads that I can batch bake in an hour after preheating my small domestic oven, baking 3 dinner breads in the first firing and 4-6 round rolls in the second. 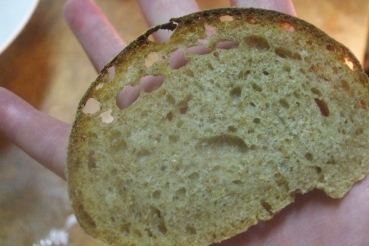 The bread has a great texture. It is moist but remains firm even when sliced thinly. It takes savoury toppings well without bending or getting soggy, making it also ideal for open sandwiches and canapés. We have enjoyed it with fish dishes and also topped it with tomato, oil and vinegar or tangy cheese and pickles. It is also good dipped simply in olive oil. However one of my favourite ways to eat it is sliced thinly with no accompaniments, so that the subtle and delicious lemon taste can be enjoyed to the full. 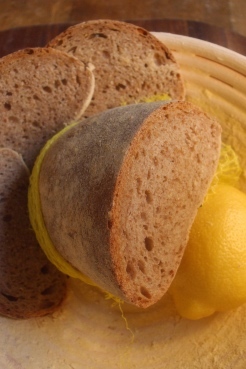 Hedh's original lemon bread is a yeasted bread made with a preferment of yellow durum wheat flour (grown traditionally on the Swedish island of Ven), and light rye flour with stone ground, strong wheat flour added to the final, machine-mixed dough. The version I am writing up here is my adaptation, a sourdough made with semolato, whole rye flour and wholemeal flour, which is hand mixed. This bread is flavoured with lemon zest rather than lemon juice. 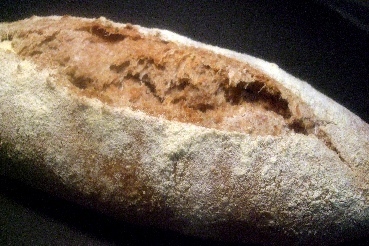 This results in subtle highnotes in the final bread, rather than a widespread lemon taste. It is well worth getting organic and unwaxed lemons to zest if available. 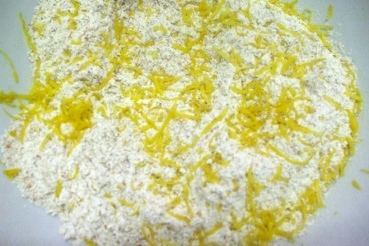 When grated and mixed with the flour the lovely aroma also fills the kitchen! 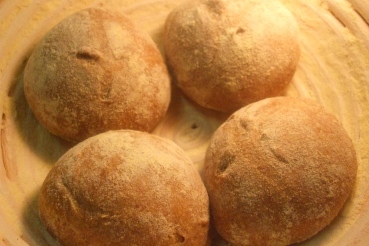 The wholemeal, olive oil infused dough has a lovely, silky consistency and is good to work with. I have baked this bread several times. The original instructions make no reference to scoring the bread. I made the first batch without slashes and they came out well. However the picture in the book shows a loaf with an open top. I later read in the Introduction that Hedh proofs and bakes some of his breads with the seam side upwards. 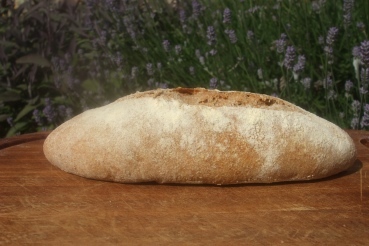 The loaf then splits along the seam, giving it an attractive rustic look. My shaping skills are not yet so good that I can prevent an unscored loaf rupturing elsewhere. I now normally score the breads with one long stroke along the top and this has worked well to date. 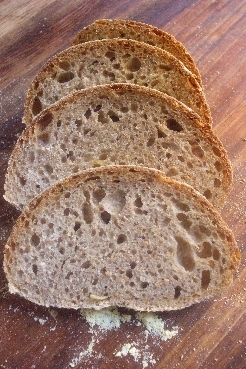 I was concerned that a predominantly whole grain formula at lowish hydration might produce too dense a crumb and loaf. I imagine that the loaves might rise higher when Hedh's original formula is used. However the preferment seems to work well with sourdough as well as baker's yeast and I have been able to get quite an open crumb and good rise for the size of loaf and type of flour used. My sourdough starters are quite feisty but the relatively low levels of starter in the preferment and final dough have meant that the overall fermentation has taken place without the dough losing elasticity. The amount of starter and fermentation times I give are relevant to my own situation. I am realizing more and more now that with sourdough starters any formula is just a guideline! Please feel free to adjust this to suit your own starters. 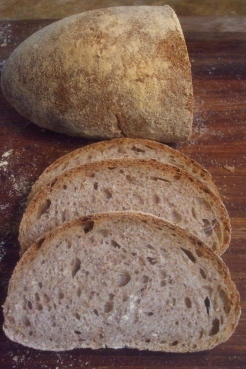 With this formula I used a wholemeal starter at approximately 66% hydration. I have made this bread successfully with wholemeal flours from Dove's Farm, Waitrose and Bacheldre Mill. Bacheldre Mill was the most fruity and aromatic. I used Dallari semolato because it was the only one available locally at the time but would prefer to use DeCecco, a brand that is sometimes available, also recommended by nicobdv. I estimate overall hydration including starter hydration at 530/945 = 56% but I'm always open to correction! Zest of 2 medium lemons, preferably unwaxed, organic Approx. 10g Will weigh next time! Combine the flours and pour the water and starter over the flour. Add oil and salt and mix by preferred method for 8 minutes. (I air knead for 8 minutes then perform one stretch and fold on the bench). Make sure that all new starter and preferment are mixed in well. Mix for another 7 minutes if needed, to form an elastic dough. 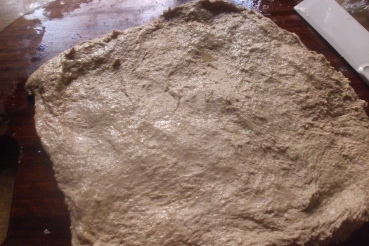 First proof Approx. 90 minutes with 1 S&F at 45 mins. Adapt as needed. Preshaping Quarter, form into balls and leave covered for 10 mins. Shaping Shape dinner breads into tapered, lemon-like rolls and smaller rolls as small rounds. 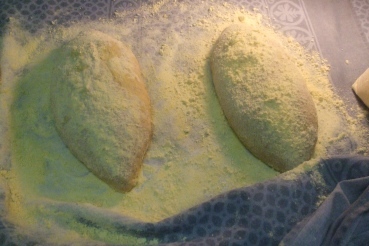 Brush with water and dust with polenta or other yellow flour. Preparation Preheat oven to C250 and prepare to steam. For steaming I preheat 2 small fajita trays and pour boiling water onto them as soon as the bread is in the oven. Check internal temperature after another 12 minutes, bake for further increments of 3-5 minutes, if needed, until internal temperature of around C90 is reached and crust is an attractive light golden colour. Anonymous baker (not verified)'s Recent Blog Entries. Sourdough Version of Richard Bertinet's Pain aux Olive.